“Wag your tail, waddle, downward duck, be in alien abduction, slosh,” are some of the other more bizarre instructions I’ll be given over the coming week. Its all part of the Yogamonks approach to aligning the spine and bringing balance into the body. 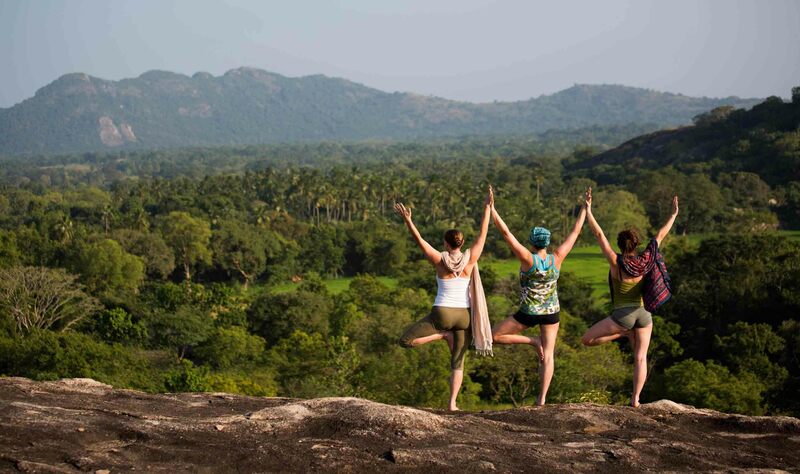 I’m at Ulpotha – a traditional working village in the jungle heartland of Sri Lanka that, for six months of the year, welcomes guests to experience a rare kind of yoga retreat. Cradled between paddy fields and a lotus-ringed lake at the base of the Galgiriyawa Mountains, Ulpotha is steeped in sacred mystique and natural splendour. According to local legend pilgrims travelling from India in search of Shiva’s son, Lord Kataragama, believed Ulpotha was a sacred site associated with the deity. The land is also believed to be the playground of Prince Saliya – the son of Sri Lanka’s most legendary king, Dutugamuna, who united the country during his reign (161-137 BC). According to the myth, the Prince escaped the ancient city of Anuradhapura with his outcast gipsy wife, Asokamala who was described in ancient texts as a rare beauty in the ‘realm of the divine’. Through a secret tunnel, they came to live in a cave above the lake at Ulpotha. Myth and legend aside, there is no disputing the magical beauty of Ulpotha and the profound impact it has on the human psyche. I’m fortunate enough to be at Ulpotha during one of the owners’ frequent visits to the retreat. A former investment banker-turned-‘accidental businessman’, Viren Perera, exudes a relaxed playfulness and the fascinating charisma of someone who knows they have a blessed life. Despite the fact he says it’s the land that makes Ulpotha special it’s obvious that a big part of the retreat’s success is his own magic. In hearing him talk about how Ulpotha evolved I come to understand that it is the product of an unusual recipe of serendipity, synchronicity, trust and fun. He chanced upon Ulpotha (meaning ‘water spring’) in the early 1990s during a road trip with two “eccentric friends” – Mudiyanse Tennekoon and Manik Sandrasagara. When they came across an old man who was selling his land and crumbling manor house Viren brought the property, site unseen, because he was enchanted by the old man’s smile and energy. As the new guardians of the land, Viren and Tennekoon set about restoring the main house (‘Walauwwa’) and started a village that embraced indigenous farming practices. Tilled by human hand and threshed by buffalo, thousands of trees were planted and diverse crops cultivated using organic farming practices that follow the lunar cycle. Eventually the village grew to a population of 40 and a way was needed to fund the project. But wanting to make it an experiment where money didn’t matter, Viren was reluctant to involve anyone from the business world. Tennekoon’s philosophy of ‘leisure, pleasure and rest’ took on the order of the day while Viren’s hands-off managerial style and insistence that there would be no dogma led to Ulpotha being run by a committee of villagers. One serendipitous moment led to another and Viren and Tennekoon met Englishman, Giles Scott. According to Viren, it took Giles’ involvement for “a more practical turn” in direction to come to Ulpotha. Giles introduced yoga as a bridge to the West, which now subsidises the village and attracts paying guests for six months of the year. The rest of the year it is for what Viren says it was meant to be – nothing. Since Tennekoon’s death Viren and Giles have remained ‘custodians’ of the land and Tennekoon’s vision for Ulpotha. Ironically, Viren and Giles are not yogis, vegetarian or by Viren’s account even environmentally conscious. But Tennekoon’s spirit lives on. He could not entertain even having a fridge as anything more than a means “for keeping unfresh food”, so aside from a small solar panel to charge handheld devices there is no electricity or need for plastic and the other trappings of modern living. “All the ingredients are here for us to live in peace, happiness and harmony with nature,” says Viren. What he likes most about Ulpotha is that to this day there’s still no fences, doors or locks. Even though the villagers scratched their heads at why Viren and Tennekoon would want to build mud huts, a commitment to only using natural materials and traditional building practices was core to their vision. Accommodating a maximum of 23 guests at a time, Ulpotha’s lodgings consist of simple wattle and daub huts. Sparsely decorated and largely open to the outside world, their elegant simplicity is a reminder of how little we really need to live comfortably. Outside my hut buffalo work the fields, squirrels scurry along tree branches, birds trill, an eagle soars, lizards laze in the sun and monkeys swing in the branches just out of the reach and disapproval of the resident dogs ‘Scooby Doo’ and ‘Didi’. Without electricity and the distraction of modern cons life at Ulpotha is dictated by the rhythm of the day. We rise with the sun and spend our days in the pursuit of simple pleasures like walking in the mountains, swimming in the lake and hanging out the hammocks that dot the grounds. Our daily program consists of morning and afternoon yoga, pranayama and meditation sessions complemented by Ayurvedic treatments and being pampered Ulpotha’s visiting massage therapists, including Australian Kahuna and Reiki practitioner, Erin Kostanski. After dark, we gather in the ‘Ambalama’ (communal area) to tell our stories. It soon becomes obvious that the very things that might frighten off some people – no electricity, yoga and meditation, cold showers, vegetarian meals and being ‘at one with nature’ – are the very things that attract those who come here. My fellow travellers are mostly 30 and 40-somethings from all walks of life. They include the CEO of an agricultural business living in Norway, a Danish schoolteacher, an Iranian psychology student and the owner of a kids theatre group – both living in Dubai, a former IT consultant studying Yoga and Ayurveda in California and the manager of a Swedish housing rentals organisation. They are all citizens of the world who love to live and travel in foreign places – and many of them are here for their second, third and fourth visit to Ulpotha. Danish businessman, Bjorn, is in the third week of his third visit here and says the communal area is one of the reasons he comes back because “you get to know people really well, really quickly”. It’s a place where friendships form easily and continue long after you leave. Ulpotha’s rotation of yoga teachers come from around the world and an array of yogic traditions to host two-week programs during the six months of the year that the retreat is open to guests. Mithila is here on her fifth visit and relishes the opportunity to teach in an environment where it’s so easy to connect with nature and our own natural rhythms. Born in Sri Lanka, she now lives in Sweden and is one of only five certified teachers of the Yogamonks method in the world. With a passion for dance, she was attracted to the teachings of Jonathan Monk as “art in movement”. “Fun, beauty and gracefulness are all part of the practice,” says Mithila. Inspired by traditional Hatha Yoga and Tai Chi, Yogamonks seeks to help the spine unwind and relax into alignment. It’s a basic-to-basics approach that encourages working consciously with the opposing forces of the body through gentle but deliberate movement. The focus is on lifting and extending from the spine, pushing in one direction to lengthen into the other instead of exerting effort. “Lead from the heart and let it lift you,” says Mithila as she encourages us to take ourselves less seriously. Lithe and pixie-faced, she’s light, playful and the perfect guide to help us untangle our bodies and minds from the stresses we arrived with. “Decide where to place your mind,” she instructs as she leads us into our meditation practice. It comes easily here. The days are listless and time moves slowly so the mind starts to go with it. The Wedegaedara is Ulpotha’s version of the day spa. Since 2005, Ulpotha’s resident Ayurvedic doctor, Srilal Mudunkothge, has been overseeing the retreat’s holistic approach to health and healing. In keeping with the way everything else about Ulpotha has come to be, Dr Srilal arrived here after a chance meeting with Viren at the Colombo Swimming Club. An off-hand comment by Dr Srilal about how hard it was to find medicinal herbs for his clinic led to Viren offering to grow the seeds at Ulpotha and an invitation for the doctor to give up his city practice to set up a traditional clinic to support the local village. A week or so after his visit, the doctor’s rent doubled and he decided to make the move. Serendipity had struck again. Proceeds from the ‘tourist treatments’ administered by Dr Srilal and his team go towards funding the free clinic established by Ulpotha for the local villagers. All guests receive a free consultation with Dr Srilal as part of the package with the option to undergo personalised detoxification and rejuvenation programmes at an additional cost. I sign up for a seven-day plan of ‘preparatory and elimination therapies’ that are steps along the path to Panchakarma (Ayurvedic detoxification). On my first visit, Dr Srilal takes my pulse and asks me a series of questions about my eating, sleeping and bodily functions in order to determine my ‘dosha’ (constitution). “There is the constitution of the universe and the constitution of the body,” says Dr Srilal. According to the ancient life philosophy of Ayurveda (meaning ‘the knowledge of life’), we can’t change the constitution we are born with but we can balance the body through the right combination of lifestyle, exercise and diet. Dr Srilal prescribes a series of daily treatments including full-body massages, facials, steams and herbal baths. I’m scrubbed with Indian gooseberry paste, turmeric and smothered in sesame oil, honey and milk until I have the tell-tale euphoric glow, red-stained feet and armpits that come with visits to the Wedegaedara. A couple of days later Dr Srilal reassures me that my pulse is better and that the strange crawling sensation around my navel is just toxins gathering in my belly. It’s all part of the process. The other important ingredient is the food. Based on Ayurvedic principles of balancing Vatta (air), Pitta (fire) and Kapha (water) our meals include the six tastes of sweet, sour, salty, bitter, pungent and astringent. With fresh produce plucked from the kitchen garden and cooked in terracotta pots on open fires, there’s an earthy wholesomeness about the menu. Curries, rice, vegetables and fruit are the daily staple and on ‘hopper night’ we party on Sri Lankan-style pancakes and the local brew, Arak. Frolicking on the lake with newfound friends one day, I recall Viren describing his relationship with Tennekoon and Giles. “Our connection was just about having fun and everything we did was just like playing,” he said. His words evoke a sense of the carefree delight of childhood and it dawns on me that this place is like Never Never Land for grown-ups. As we gather in the tea hut on my last morning at Ulpotha I wonder if I’m one step closer to the ‘Moksha’ (enlightenment) Dr Srilal described as the ultimate goal of Ayurveda. Somewhat ironically, I catch a glimpse of a fellow guest’s tattoo and its reminder that ‘this too shall pass’. But for the moment I promise to hold onto the magic and memory of this little piece of sacred Sri Lanka.